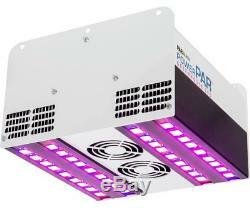 ParSource PowerPar Professional Indoor Greenhouse LED Grow Light ILP600 600 Watt. ParSource PowerPar Professional Greenhouse LED. AWESOME Price on Brand New 600 Watt PARSource PowerPar LED Greenhouse Light. This professional grade light features a 50,000 hour life to L70 thanks to excellent thermal management allowing operation in greenhouse ceilings with ambient temperatures up to 120 F while providing excellent efficiency of 94.5%. It has constant-current drivers and 6kV input surge suppression making it suitable for wet locations. The PARSource PowerPar is designed and tested specifically for indoor grow operations. These scientifically developed and horticultural growth spectra ensure optimum plant growth and the highest yields. The PARSource PowerPar offers excellent thermal management by means of a custom, extruded aluminum heat sink. Venting slots at either end of the fixture and dual, replaceable, high-efficiency cooling fans provide further cooling. Blue (400 - 499 nm) 22.8%. Green (500 - 599 nm) 0.3%. Red (600 - 699 nm) 76.8%. Far Red (700 - 780 nm) 0.1%. The item "ParSource PowerPar Professional Indoor Greenhouse LED Grow Light ILP600 600 Watt" is in sale since Saturday, May 13, 2017. This item can be shipped to United States, Canada, United Kingdom, Denmark, Romania, Slovakia, Bulgaria, Czech republic, Finland, Hungary, Latvia, Lithuania, Malta, Estonia, Australia, Greece, Portugal, Cyprus, Slovenia, Japan, China, Sweden, South Korea, Indonesia, Taiwan, South africa, Belgium, France, Hong Kong, Ireland, Netherlands, Poland, Spain, Italy, Germany, Austria, Israel, Mexico, New Zealand, Singapore, Switzerland, Norway, Saudi arabia, Ukraine, United arab emirates, Qatar, Kuwait, Bahrain, Croatia, Brazil, Chile, Colombia, Costa rica, Panama, Trinidad and tobago, Guatemala, Honduras, Jamaica, Thailand, Malaysia, Philippines.